Join Rod in a three-part Yoga For Shoulders intensive. Learn Iyengar yoga techniques to promote shoulder health and mobility. This course is ideal for stiff shoulders from poor posture, stress or other specific issues such as frozen shoulder. Help your shoulders recover with this tailor made course taught by a certified, experienced teacher. Explore a range of yoga poses that can help to improve the health of your shoulders. The Iyengar method has a comprehensive array of poses and adaptations suited to this purpose. This course gathers together a range of these poses and condenses them into three sequences that can easily be practiced at home. You will develop your shoulders in all directions of their potential movement. This is an intermediate level course. Completion of the Yoga Selection beginners program or equivalent is recommended. The course is also useful for advanced students suffering from shoulder difficulties. If you have a shoulder condition, please seek permission from your doctor prior to participating in this course. These classes will help you strengthen, stabilise and release your shoulders. This can assist with reducing pain and restriction and improving overall body posture. If you suffer from a specific condition such as frozen shoulder, regular practice of these poses can help to restore mobility and functioning. Stronger and more flexible shoulders will assist you to make more progress in other yoga poses such as backbends. Focus: This weeks intermediate class is the first in a series of classes featuring shoulder opening yoga poses. It focusses on reclining shoulder poses. Approaching these poses from a prone or supine position can be especially helpful if you are working with stiff or injured shoulders. You will have more ability to isolate and target specific actions and regions, and more options to support or modify each pose where needed. This class may be beneficial if you are working with shoulder problems, or wanting to improve your shoulder mobility. It will also aid anyone wanting to learn more about the Iyengar approach to shoulders. Focus: This class is the second in our series of yoga poses for shoulders. It groups together shoulder poses that can be practiced from a kneeling position. The action of kneeling (virasana or vajrasana) is not necessarily intrinsic to all of the poses. Some of the arm variations in the class could also be done from a standing or seated position. 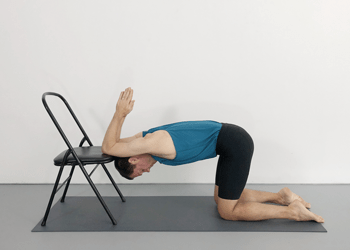 The poses are linked with kneeling in order to gather a range of shoulder opening movements, that can be conveniently practiced in succession, without continually needing to change the position of your legs. The class can be practiced as a stand alone class to improve shoulder mobility, or combined with other classes to build a more extensive practice sequence. Focus: This class is the third in our series of classes on yoga poses for improving shoulder mobility. It focusses on shoulder opening poses that can be practiced from a standing position. The sequence features an array of modified classical asanas. The modifications help to enhance the therapeutic benefits that can be brought to the shoulders. These poses are commonly practiced within the Iyengar method. The sequence attempts to be consistent with Iyengar teachings, whilst also being practical and accessible to a home practice. This class can be practiced as a stand-alone class, or in conjunction with the other shoulder classes in this series.